Some authors make a special effort in trying to match their material to described but never illustrated taxa. This may lead to rediscoveries of species which have been neglected for many years. The recent paper by Watters et al. (2013) provides an excellent example of this, where they studied material from Hispaniola and provide a suite of arguments why Pfeiffer’s Choanopoma? 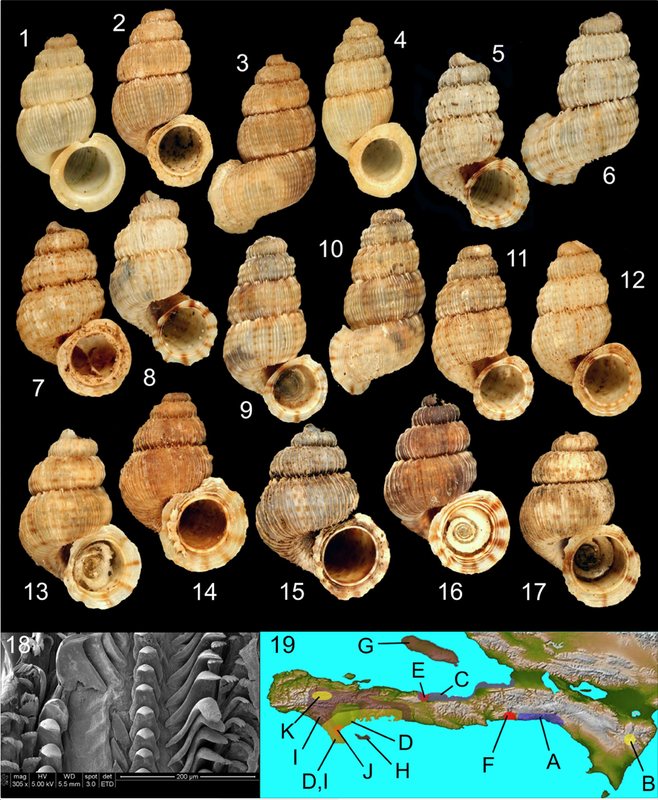 smithianum can be considered a valid taxon; they classify this taxon with the genus Weinlandipoma Bartsch, 1946, and also fixate a neotype from modern material collected at the type locality Haiti, Dept. du Sud, Citadelle de Platons (figs 1-4). Weinlandipoma macayaense, figs 9-12, type locality: same as above (UF 451540). The three species are partly sympatric, but also a variable fourth species occurs in the study area and calls for more research to clarify the situation. Watters, G.T., J. Grego, J. Steffek, 2013. Rediscovery of Choanopoma? smithianum Pfeiffer, 1866 (Annulariidae) from Haiti and designation of a neotype, with the description of two new species of Weinlandipoma Bartsch, 1946. – The Nautilus 127: 78-84. This entry was posted in Uncategorized and tagged annualriidae, taxonomy, westindies on July 18, 2013 by bramb. 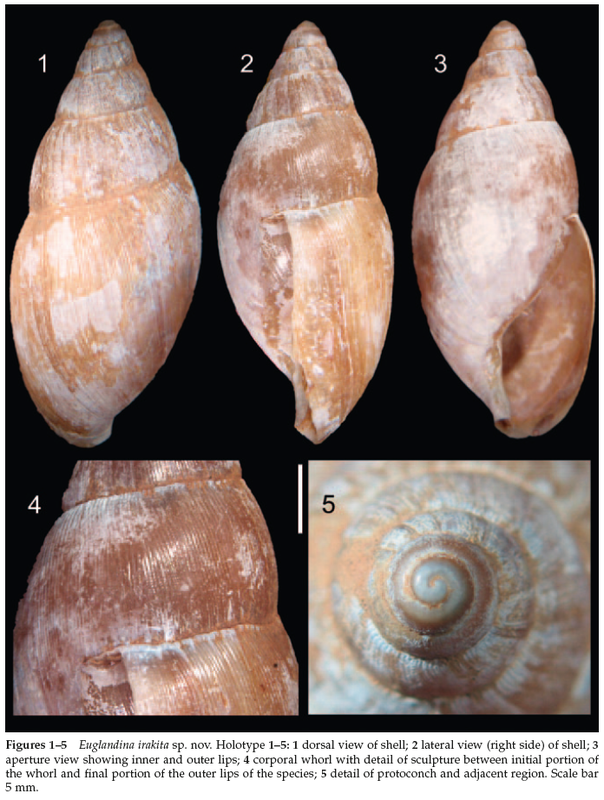 Last week a second taxonomic paper describing a new Brazilian land shell appeared (Jardim et al. 2013). oblong outline, deep sutures and a narrow aperture. A comparison with other species of Euglandina is provided. Jardim, J.A., Abbate, D. & Simone, L.R.L., 2013. A new species of Euglandina (Pulmonata, Spiraxidae) from Brazil. – Journal of Conchology 41: 327-330. This entry was posted in Uncategorized and tagged brazil, taxonomy on July 1, 2013 by bramb.